Roller lifters had been around for years and were used in various applications such as radial aircraft engines, but when a few progressive engine builders started adapting them to race engines, horsepower and rpm made a huge leap forward. Cam grinders began designing cam profiles with shorter durations and higher rates of lift than a traditional solid lifter could tolerate. The result was incredible power gains especially with the typical modified O.E. style cylinder heads of the day. As valvetrain loads escalated with more lift, rocker ratio and spring pressure, the roller lifter was overtaxed and suffered frequent failures. Dan Jesel realized early on that the success and demand for his high-end valvetrain components was in part dependent on huge valve lifts, unheard of spring pressures and rpm that most thought was impossible. So he started on a 10-year quest to “perfect” the roller lifter. After nearly nine years of R&D and endless testing, Dan brought the first Jesel roller lifters to market in 1998. Since that time, Jesel roller lifters have stood as the industry standard in NASCAR, NHRA’s Pro Stock, Top Fuel and Funny Car, as well as endurance racing on the world stage. Like most of Dan’s innovative designs the Jesel roller lifter bore little semblance to traditional roller lifters. Most notable was the lack of a link (tie-bar) connecting the intake and exhaust lifter pair to maintain alignment with the camshaft lobes. Instead Dan bushed the lifter bore with a special bronze alloy bushing featuring a “keyway” groove cut for a special hardened pin on the lifter body. The pin rode up and down in the keyway groove, keeping the lifter aligned with the cam. This allows the tie-bar to be removed, the lifter body to be shorter, saving significant weight. Another aspect of Dan’s new lifters was that everything was bigger - a .937” diameter body with a .785” roller, a larger axle and needle bearings and an internal axle locking pin eliminating snap rings, all resulted in a stronger and lighter lifter. The combination of the smallest .937” diameter lifter body and roller scale in at just 97 grams. Making the roller lifters larger in diameter allowed Dan to offer them with centered and offset pushrod cups to reduce pushrod angularity. The keyway lifters are available with a .000”, .050” or .150” offset pushrod cups. Another one of Dan’s little tricks with the pushrod cups was to lower them as much as possible in the lifter to reduce side loads and friction. The larger diameter lifter bodies also accommodated larger diameter rollers that not only rotate slower per given rpm, they spread the load better on the cam. In virtually all of Jesel’s lifter styles there is a choice of body and wheel diameter to fit most popular applications. 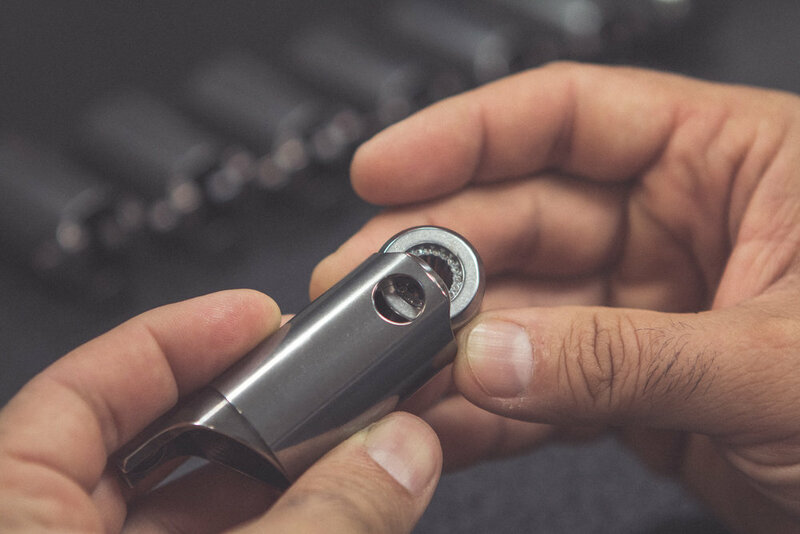 Although a good deal of durability was gained through the upgraded size of the lifter components, the real story behind Jesel’s reputation for reliability lies in its choice of materials like the tool steel for the lifter bodies and its incredibly precise machining tolerances (±.0002”). Combine that with the special surface finishes and coatings that have been developed over years of testing and research, and you have incredible durability and wear resistance. After a successful entry into the roller lifter market with its Keyway and Tie-Bar design, Jesel has produced several other styles. Chronologically they are the Dogbone Lifter that derives its name from the dogbone-shaped steel retainer that bolts to the block and maintains lifter alignment, the Nitro-Alcohol Lifter – a beefed up tie-bar design for Nitro and Alcohol engines and the tie-bar Solid Body Lifter for sportsman applications. Jesel’s Dogbone roller lifters are an alternative to Keyway Lifters because they do not require special lifter bushings to be installed in the block. Dogbone retainers can be easily installed with a simple drill jig available from Jesel. They have the standard features found in all Jesel lifters − an ultra-light design, pressurized roller oil circuits, hard-coated steel bodies, aluminum pistons, hardened-steel pushrod seats and internal axle locking pins. Top Fuel and Nitro Funny Car racers were replacing roller lifters after just three or four passes and still encountered failures, often resulting in a fireball and track oil-down. The massive cylinder pressures produced by these engines simply crushed standard roller lifters, so Dan designed the Jesel Nitro-Alcohol lifter that features a 1.000” diameter body on a .905” diameter roller fitted with precision sorted tool-steel needles. After switching to Jesel Nitro-Alcohol lifters, teams were seeing the lifter life increase to 35 passes or more. A recent addition to the Jesel roller lifter lineup is its Solid Body roller lifter. It was designed as a cost effective alternative to its renown TS Series Tie-Bar lifters. They are a perfect fit for sportsman and professional racers alike for all forms of racing including drag, circle track, road racing, marine and street performance. The Jesel Solid Body Roller Lifters feature a one-piece DLC coated solid steel designed body with the pushrod seat machined directly into the lifter body. They are available in various pushrod offsets for port clearance and use the same rollers, precision-sorted needle bearings and axles found in Jesel’s TS Series. Just when it seemed that roller lifter innovation had hit a wall, Dan Jesel introduced his latest concept, the Jesel Cartridge roller lifter. It is a stand-alone roller lifter pair that contains the lifters and bronze bushings and can be installed or removed in an aftermarket block with a single retaining bolt or stud. It is limited in application to those aftermarket and billet blocks that can accept the assemblies’ 1.312” O.D. Jesel’s Cartridge lifter is big – the lifter body is a full inch in diameter and the wheel measures 1.220”. Channels machined into the lifter bushing guide the wheel and maintain alignment with the camshaft lobe. Jesel’s Cartridge roller lifters offer several advantages. The huge 1.220” wheel turns slower than a lifter with a smaller wheel. Also, the larger wheel reduces the pressure angle against the lifter. It is also easier to properly clean a block and any debris that might get trapped between the lifter bushings and the lifter bores. The most obvious advantage doesn’t come into play much, but in the remote chance that there is a problem with a lifter or cam lobe, the lifter assembly can be easily changed at the track by removing a single bolt or nut (if studded in place) and replacing the cartridge. Dan has made a huge commitment to building roller lifters that actually enhance the durability of a racing engine. His designs have been proven under the most extreme conditions and Jesel has sourced the dedicated CNC machining centers and specialized assembly tools to produce the finest lifters possible.